Chuaigh Rang 4 amach go dtí an suíomh álainn seo sa bhliain 2001 chun foghlaim faoi stair, tír eolas agus nádúir na háite. Our exploration of Doon has featured on the Intel Odyssey Site, a website which features computer project work from around the world. We were awarded a digital microscope for our participation. 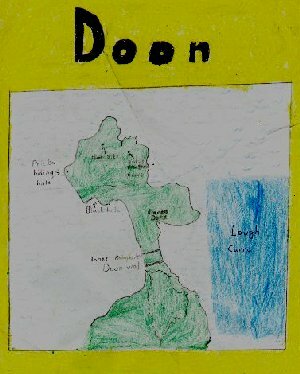 On the right is a map of the Doon Peninsula as drawn by Daiví. It sticks out into Lough Carra. This is part of the Iron Age rampart which protected the inhabitants of the peninsula. When Doon was under attack, the soldiers used two walls so the attackers couldn't get in. The walls were very very powerful. If the first wall was overrun, the attackers had to get past the second wall. There was a tunnel that a priest used to hide in. Seo Rang 4 leis an gclann Quinn roimh an turas. Doon peninsula is an interesting place. We learned quite a lot of things about the peninsula. For instance, I learned how deep the water is in the black hole. That was 60 feet deep, and we learned lots of other things also. The peninsula had lots of wildlife and trees and flowers. I liked going through the trees because it felt like you were in a jungle. Doon is situated Burriscarra, Clogher, Claremorris Co. Mayo about 10 miles away from Castlebar. We visited it to learn about our heritage and history. Doon peninsula is on Lough Carra. It is a historic site dating back to the bronze age. People lived here 2000 years ago. People lived in huts 2000 years ago. The huts were made with hazel coppice, daub and thatch. The water looks green in Lough Carra becausa it is a limestone region and the lake has a sandy bottom. This sand is known as marl. Ag teacht amach ón bpluais. During the Irish War of Independence mass was cancelled, so the priest in Doon hid in the cave formed in the iceage. Is áit álainn í loch Carra. Tá gaineamh ag bun an locha. 'Marl' an t-ainm thugtar air. Tugann sé dath glas don t-uisce. Tá bunús aolchloch san áit seo. Fásann giolcaigh san uisce. Tá an cré go maith agus is féidir linn a lán crann a fheiceáil ar an leithinis. Tháinig na Normannaigh, na Manaigh agus na Sasanaigh anseo mar tá an talamh go maith agus is féidir le daoine dul timpeall na haíte go héasca i mbád. Thóg na chéad fheirmeoirí tithe ar nós an tí sa phictiúr. Ar dtús báire chuir siad poll sa talamh. Chuir said bataí adhmaid i gciorcal timpeall air. Ansin chuir said féar agus tuí ar an díon. D'fhág siad poll sa díon chun an deatach ón tine a ligean amach. Ní raibh ach doras amháin i ngach teach agus ní raibh fuinneog ar bith ann. Bhí tine acu sa lár. Seo ceann de na crannóga a rinneamar sa rang. Bhí na tithe, ina raibh na feirmeoirí ina gcónaí ar an leithinis, déanta sa bhealach céanna. Doon's history goes back 2000 years. There is a strong rampart that protected the peninsula from other invading tribes. The rampart in Doon is 130m long and the defending troops were heavily equipped. If an intruder got past the first rampart there is a second rampart that is even higher than the first rampart. Bí cúramach leis an bhfear seo! 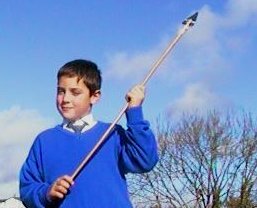 He's made a lovely replica of a Bronze-Age spear.